"GHOSTBUSTERS (Stern) Inside cabinet wall art" has been added to your cart. 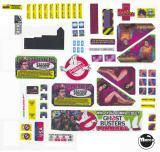 Custom inside cabinet wall art blades for Stern GHOSTBUSTERS PRO, PREMIUM and LE version pinball machines. Easy to install premium graphics created by the famous artist Zombie Yeti.